UPDATE: 6th grader's talent show performance of "Paparazzi" is on course to hit more views, over 21 million, on YouTube, than Lady Gaga's! 1. Find and learn from a model of success. Greyson chose for his inspiration Lady Gaga. Not a bad choice considering the fact that she is the first entertainer to achieve one billion views on YouTube. 2. Find your voice and sing. Greyson Chance has never had a voice lesson, yet he has a voice that has propelled him to stardom. What made all the difference in the world was his decision to sing. 3. Share your passion. Ah...just watch the video that follows. 4. Be authentic. Be yourself. Chance chose to sing an extremely popular song from an extremely popular singer. Yet, he made the song his own. His version of "Paparazzi" is not an imitation of the original: it is an original, new version of the original. 5. Don't give in to skeptics: convert them. As Greyson began his performance at his sixth-grade talent show, the expressions of his classmates seemed to convey disinterest at best: his performance visibly transformed skeptics into fans. 6. Content is still king. All the search engine optimization in the world still has a tough time trumping raw talent. Content, really good content, whether it's a song or story, is still the best way to be found. 7. With compelling content, video is a viral rocket. YouTube is celebrating its fifth-year anniversary with two billion daily views. 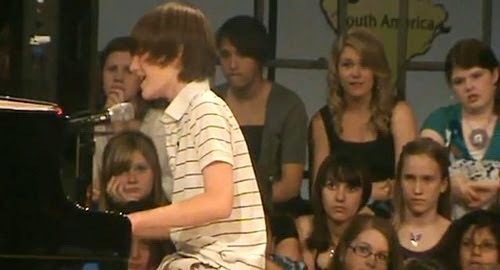 Twelve-year old Greyson Chance is one if its users who decided to upload a video from his sixth-grade talent show. 15-million views later, the video shows no signs of slowing down in its viral trajectory. 8. Give your friends more than one forum to connect. Greyson first uploaded the video of his performance to his Facebook page, then to YouTube. He has since added a Twitter account. #6 is probably my favorite. A) His first name is Greyson. It's Greyson Michael Chance. This looks more like a story of old media than new media. Or, at least, the meeting of the two. The Greyson Chance video sat on YouTube largely unwatched for almost two weeks. Then it was announced that he'd be on Ellen and all sorts of traditional news sources from FOX and CBS to the Wall Street Journal and L.A. Times hyped the upcoming appearance and linked to the video. Then, it gained traction. What we're witnessing here is the old style of publicist learning how to create a sensation online. It's manufactured viral pr. Of course, at some point the mainstream media latches onto the phenomenon, hypes it, and it soars even more. Thanks, Great! Well thought-out review. For business process solutions it is the best way to receive mobile apps development.